This is where the child bride and I spent much of our afternoon last Thursday. 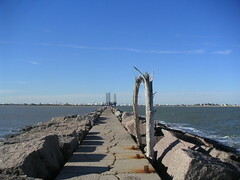 It is the jetty at Quintana, Texas. Quintana describes itself as "Gateway to the Texas Gulf Coast." That's not much of a claim to fame. Many of my childhood summers were spent on this jetty and swimming in the ridiculously warm waters that surround it. On the horizon you can see a drilling derrick and countless white and utilitarian structures. That is all chemical plant. I'm not sure if it's just one facility or a number of them. You can also see the rusted bases for a wooden railing that once ran the length of the jetty. All the railing has been ripped out by storms. How many extra arms, legs or "other" appendages did you have removed as a child, a result of swimming in bromine, raw crude and dioxin?